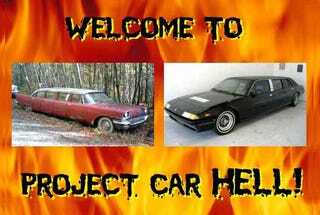 Project Car Hell, Limo Edition: 1957 Chrysler or 1981 Ferrari? Can an American car- even a 60-year-old American car made by a long-defunct manufacturer- compete with an entry PCH Superpower Italy? Not according to our most recent Choose Your Eternity poll, in which the '38 Studebaker Dictator lost out to the '68 OTAS 820. That might have something to do with the fact that most of the OTAS now resides in the belly of the Rust Monster, but it also points out just how tough it is to beat a PCH Superpower. However, Project Car Hell is all about beating your unstoppable head against an immobile brick wall, forever, so we're coming right back with another Italy-versus-America matchup. And not just your quotidian-type X-1/9-versus-Pacer deal, oh no- today we're plunging headfirst into the molten sulfur of Custom Stretch Limo Hell! Project Car Hell: Studebaker Dictator or Otas 820? Ah, the custom stretch limo! Conjures up treasured memories of projectile-vomiting Bacardi 151 all over your prom date's Very Expensive Dress, don't it? Keep in mind, however, that renting a custom stretch is one thing... but owning one takes the whole Limo Experience to a new, even classier level. But stretched Town Cars or even Hummers are a dime-a-dozen; you need something as cool as the Toronado Limowagon if you want to haul your entourage in the style to which they're no doubt totally unaccustomed. Something with fins. Something like this 1957 Chrysler Windsor 8-door airport limo (go here if the ad disappears), which is priced at a get-your-eyes-checked $4,500! The seller figures there's no need to waste time listing everything wrong with this car; instead, he or she has posted a single hazy photograph and included the following two sentences of description: "Looks like Christine, the killer car. Needs complete restoration." There you have it! So many questions unanswered (and, by the way, wasn't Christine a '58? And a Plymouth? ), but we're pretty sure you can count on any question involving synonyms for "iron oxide" being answered in the affirmative. But put on your triple-thickness rose-colored glasses and picture yourself behind the wheel of this car after a full bank account and sanity depleting restoration, trying to see around that enormous blower you'll have perched on top of a gasser-style 392 Hemi! An 8-71-blown Hemi '57 Chrysler limo would be the bee's nuts indeed, but what if you rumble up to Wet T-Shirt Night at Rohypnol Ron's and, just as your betuxed homies pop open all those doors and get ready for a truly grand entrance, a dissenting voice from the awestruck crowd cries out "But that's an airport limo!" and then the spell is broken? What then? Well, you could play the trump card of a series of hemi-powered Limo Donuts in the parking lot... but what if you'd taken on a different stretch limo project? What if you'd purchased a custom stretch Ferrari? And not some Fiero-based "Ferrari" but the real deal? You'd think such a thing would be impossible to find, but just check out this 1981 Ferrari 400i stretch limo (go here if the ad disappears) and then try to tell us that the American Dream isn't alive and well! That's right, a stretch V12-powered Ferrari! It's a lot more expensive than the Chrysler, and the seller says it's "mechanically sound, clean but can use some minor cosmetic work." But come on, a 27-year-old Italian car that's been hacked up and then driven at 12MPH while the interior gets hosed down with every bodily fluid that Newport Beach promgoers and 4th-tier celebrities can emit? Hell!